It is Sunday and it turns out I have a little time today and as I need to write my blog from Saturday evening I figured why not go to Starbucks as Susan. 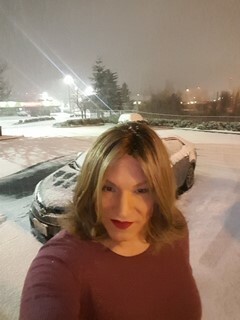 It was a little after 2 when I started getting ready and I was at the Starbucks by my house by a little after 3 with my computer. They were a little busier today I guess Sunday afternoons are a good time to go to Starbuck. I got my drink and sat down and got out my computer to do my blog. Now as I said this was kind of a last-minute outing and not really well planned. I figured I would have a few hours here to do my blog and some work on the computer but I forgot they are now closing at 6 on Sundays. Well that still gives me 3 hours. I got connected to the wi-fi and opened my blog and noticed that my battery was only half charged, yes, I had used it last night at the escape and then forgot to plug it in and of course I didn’t bring the power cord. Now as I said this is close to my house, I could have run home and got the cord and been back in 5 minutes but that seemed a little strange to me. I decided to just go and see how long my battery lasted. I finished my blog and I still had a little battery left so I was just goofing off on the internet, a good way to waste some time. It was just before 5 when my computer told me I had 10% and I knew it wouldn’t be long. I wasn’t even going to make it till 6, so sad as I was not ready to go home yet. I was checking my Facebook page and I saw a post from a friend who had gone and saw the new Star Wars movie and I thought to myself, I haven’t gone to the movies in a while either male or female and I wanted to see the movie, yes, I am a big Star Wars fan. I quickly checked the times and the downtown Vancouver cinema had a 5:50 showing. I didn’t want to go to late as it is almost a 3-hour movie and I do need to get up early tomorrow. It was 5:10 now and only takes about 10 minutes to get there so it was decided. I am going to the movies. Now I like this theater as it usually is not busy and I figured being a Sunday evening that would be the case. I was in my car and on my way. I got to the theater and there were all kinds of people leaving the theater and going to the theater and lots of cars going in and out of the parking garage. I guess everyone thought today was a good day to go to the movies. I parked and walked across the street to the theater where I had to stand in line to get my ticket. It didn’t take long and soon I was inside and again I had to stand in line to get into theater 6 where the movie was playing. Now I did feel a little out of place but not for how I was dressed but because I was by myself, not many people go to the movies alone. Soon they let us in and it was one of the bigger theaters here, I got a seat about the middle and waited for the movie to start, being a big theater, the amount of people was small but that would not last. I had hoped by waiting so long after it came out there would not be as big of a crowed. Again, I was wrong by the time the movie started I would say it was 80% full, I did have 1 empty seat either side of me, I am thinking people left it thinking I was holding them for someone. Out of all the people as I looked around there were 2 other singles in the crowd but both were men. Now the movie itself was good not great, there were some parts where they went for laughs and it didn’t work in the plot. Probably one of my least favorite from the Star Wars series. The movie was almost 3 hours long. It was a fun night though and that is what counts. Thanks for reading and keep up with my most recent blog. Well I started getting ready and I guess I took longer than I thought as it was 10:30 when I was finally ready. I grabbed my computer and I was on my way. Now there was a lot of traffic for a Saturday and that slowed me down so I actually got to the theater about 10:50 and parked in the parking garage across the street. now I had no idea how busy they would be or how full the theater would be. the movie has been out for a while now but then it is also a Saturday so I guess I will find out. I walked across the street and there was a couple in front of me in line buying tickets for Star Wars: the force awakens. I got to the window and got a ticket, the lady asked if I had a Regal card which I do but I left it in the car and there wasn’t time to go back and get it so no discounts for me today. I went in and went to the Theater. there were about 20 people in there so I had my choice of seats to a point. To my surprise I was not the only one there by myself. there was a man in the front row and a woman one row behind me. well getting there late I didn’t have to wait long for the movie to start. Okay now I am a big Star Wars fan as I still remember standing in line to see the first one back in 1977, wow it is hard to believe it has been almost 40 years since the original Star Wars came out. The movie was good not as good as some and better than others but in all I was happy with it and glad I saw it. If you are a Star Wars fan you need to see it. It even had 3 of the original cast in the movie of course they were much older. The movie is about 2 hour and 15 minutes long. By the time the movie got over and I got out to my car it was almost 2 pm. I thought about going shopping but decided not to. I have some work I need to catch up on and I am also almost out of gas as I forgot to fill up yesterday.I figured I would go to the Starbucks by my house and do my blog and catch up on my work before heading home and changing for tonight to go to the Escape. I Stopped and got gas first at the station right by my house. now it was a little cool out and windy so I got a little cold filling up my gas tank. I drove across the parking lot to Starbucks and went in. There were about 12 people inside. There were 2 woman a head of me in line. I got to the counter and the young man asked me what I would like, as I was cold I ordered a hot chocolate, Starbucks has the best hot Chocolate. He took my order and even remembered my name. I will give Starbucks credit as there employees are good at remembering names. I also ordered a cheese Danish as I was kind of hungry. I got my order and went and sat at a table by the window. Now the sun is out and shining through the window and it feels really good, it didn’t take long though for me to remove my sweater. It is actually really warm sitting here but it feels so nice, I am ready for summer and the sunshine. now a little side note as I did my makeup this morning I tried to do my lips with a fuller look. last night doing the bottom lip looked so good I also tried it on my upper lip. I don’t like the way the upper lip turned out, I think on me it looks fine to make the lower lip fuller but not the upper, will have to remember this. Well I sat here doing my blog and watching people come and go, it really is a steady stream of people that come here. As much as I have come here over the last two weeks I keep waiting to see someone I know. It is 3 pm now and I am just finishing my blog. I have some work to do that I hope I can get done over the next hour or so. I hope to be home by 4 so I can relax a little and then change for the evening with the hope of being at the Escape by 6. Thanks for reading and I hope you all have a wonderful day.